Here’s part 6, the final part of my video series. I hope you’ve enjoyed it. 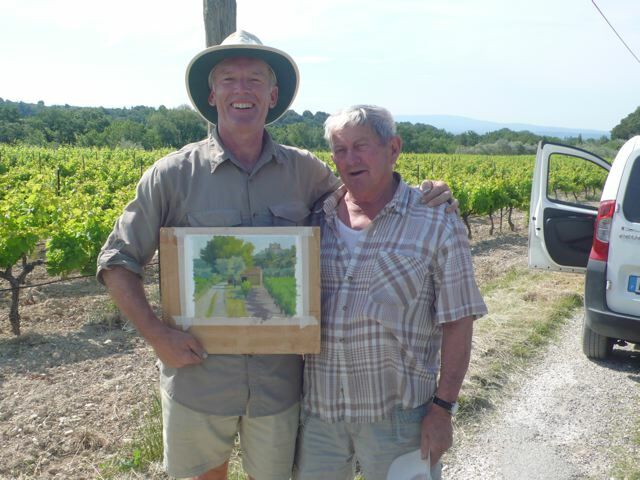 Between the two Provence workshops this year, my wife Anne, came over to France and we spent a week painting. I had seen something during the first workshop that I wanted to come back to paint in early morning light. So I painted that and as I was finishing I noticed someone had stopped down the road next to Anne. As I approached I saw Anne talking with an older man. He introduced himself as André. He was retired, he said, but had cared for the vineyards that surrounded us all his life. And the olives and apricots beyond. He now lived in town, in Carpentras, but came each day to do a tour of his land. His son now cares for the grapes. André said: “Je suis paysan, pas agriculteur.” I am a peasant, not a farmer. I care for the land, not farm it. Then he asked if I could paint the view for him. A view he said that was his favorite, that reminded him of his years of being here, that he could hang in his home since he now lived in town. As it happened I loved this view also. This very spot, I told him, I had photographed and used the photo as my promotional shot for the Provence workshops for years. I told him the price I would normally sell for an 8’ x 10” in the U.S., clearly in my mind more than he had for it, but I said since I loved this view also and since it was for him, 1 quoted a price about a fifth of my regular price. To that he agreed. I went down the next morning and began around 8:30. Because it was for André, a man who had lived and worked so intimately with this place I found myself unable to simplify as I normally would. It became like a family portrait. I felt I had to honor the custodian. 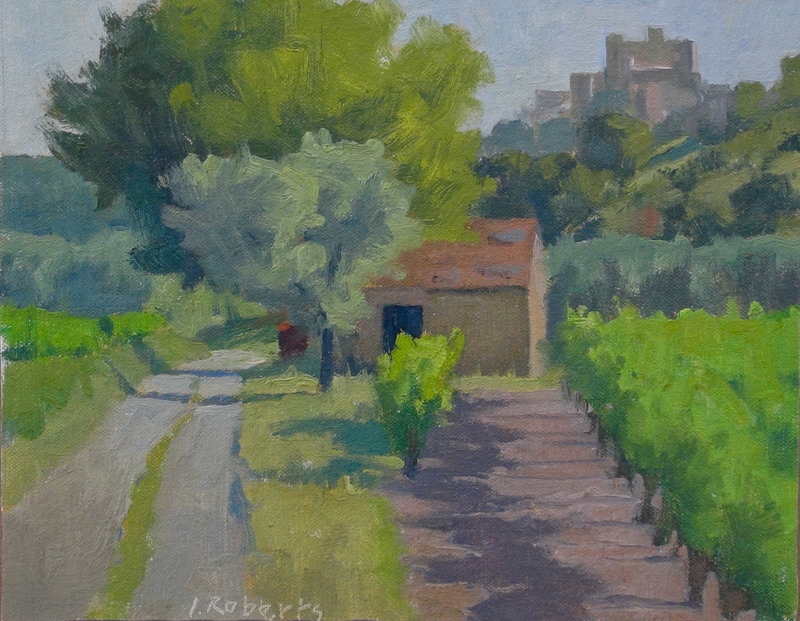 Le Barroux, the village on the hill, I couldn’t just flatten into a simple blue shape. I found myself painting it. The hill behind the fields I painting in a red tree that I felt sure he must know. I painted the heavy rocks he had put on the roof of his abri, the toolshed, to protect the tiles from the harsh wind, the Mistral. I painted in the rusted metal cart beside the abri, which had been there for the five years I had been coming there. And I painted the foreground vines pulling me right down into (and probably out of) the bottom right of the painting. I had to paint André’s vines so he could see them properly. I finished in a little less than two hours. It felt good working for a wage. André arrived on his daily tour as I was packing up. I showed him. I could tell he loved it but he asked if I could change one thing. With commissions this is always a sticky moment. He wanted me to make the rusted metal wagon next to the abri smaller. André told us the story: when he first took over the fields from his father, he needed one of the metal wagons which they used for the prunings from the vines, so they could burn them safely in the field. He advertised for one. Someone responded. They lived hours away but André decided he would take his truck and tow it home. Upon arriving he discovered the wagon had metal wheels and he couldn’t tow it so the seller suggested they cut the thing in two with a torch and he could load it on André’s truck so he could take it home. Which they did. However when he arrived home both his father and uncle laughed at him because now cut in two it couldn’t function (for a reason I didn’t really understand since it looks like it was all in one piece) and so he dumped it next to the abri where it has stood since. Almost fifty years. But it reminded him of one of his more foolish moments so I obliged him and cut it in half myself, but in paint. I mounted the painting a few days later and delivered it to André’s son. Fortunately André was there himself. He took his painting, paid me, then took me to the small room where they sell their wine. He gave me a red, a rose and a white. The rose I drank the next day at lunch with my landlord and his wife. The red and white are resting until May in the cave for when I return.